Volunteering is the perfect way to feel connected to the community. The simple act of offering your skills and enthusiasm will positively impact the lives of others, as well as your own. Many opportunities for contributing your time and talent are available at the Monastery. Let us know a little about yourself, what kind of things you would be interested in doing, as well as your availability. Our Business Manager will review your submission and contact you to discuss possible needs. At the Monastery of the Holy Spirit, we are here to support you and we welcome your prayer request. 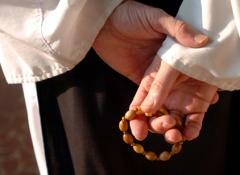 Please submit your request online and the community will pray for your intentions.